The leading revenue management company for hotels has just announced its acquisition by Booking.com. Arthur Waller, CEO & co-founder of PriceMatch, tells us more about managing growth within a startup, from the Partech Shaker in Paris. Marie Raichvarg, Partech Shaker: You’ve been working from the Partech Shaker for a little less than a year. Any tip on how to make the best of the place ? Arthur Waller, PriceMatch: The Shaker is THE perfect place to grow in Paris. It is completely flexible and you can grow progressively without thinking of logistical and administrative details. When you hire a new employee, you just pay a new desk and that's it. Dont think about having the phone and the wifi working anymore. The great rooftop will help you hiring, and will make your employees and your customers happy. When you are scaling and growing, you want to focus ONLY on what matters: your product, your go-to-market. Everything you can forget about is great. And the Partech Shaker offered us this chance to be focused. Though, you also want to benefit from the rest the Partech Shaker can offer you. First of all, talk to as many startupers as possible. There are 250 other people in the building working for start-ups. Odds are high that someone else in the building is trying to solve problems similar to yours. Then there are a lot of events to help you learn more on a specific point you want to improve. Finally, the real strength of the Shaker is that Partech was able to bring together several Corporate Partners that often come to meet start-ups. Take that chance to try working with them and at least listening to what they need. MR: There was no obvious corporate partner for PriceMatch in the Partech Shaker but you’ve been in touch with several anyway. Do you have business discussions with any of them ? AW: We presented our company to the top management of Saint-Gobain and people were very interested. They realized that we must have a lot of mutual customers as they are selling windows to many hotels. We've been catching up again recently to try to find out how we could build a win-win partnership. MR: It’s a well-known fact that the business relationship between startups & more established companies is often a cultural challenge. Do you have any advice for startups willing to do so ? AW: You need to understand who's the decision maker in front of you, what his / her challenges are and what risks this person takes when working with a start-up like you. Then you need to show that those risks are low and at least that it is worth taking that risk because the upside is so huge for a big group when working with a start-up. The agility, the flexibility, the speed of a start-up are very valuable for a big group and a nice source of inspiration. You obviously need to be patient as decision cycles are pretty long in big groups. MR: What would you say the biggest challenges are once you’ve raised your first seed money ? AW: When we raised our seed money in November 2013, we had no or almost no revenue. We had a nice product and a nice team. It was time to convince hotels to pay for it, which is another job. I think it is key to find skilled sales people early enough. It is key to stay focused and to prioritize. MR: You & your co-founders managed to succeed in the very challenging topic of managing a growing team, can you share with us a human ressources’management tip ? AW: We actually grew the team from 30 people up to 85 people in the past four months. A great challenge ! First you need to hire the right people. I'd advise to be proactive and to "hunt" the right guys on Linkedin instead of waiting for the right guy to apply. Then you need to onboard them properly, and to involve them. That means you have to tell them the story, where you are coming from and where you are headed. Finally, you need to have a very efficient CRM in place with the right processes to be able to monitor the performances of everybody and to detect early enough a problem. Obviously having senior experienced managers helps a lot. MR: Where will you work from now on ? AW: From now on, my cofounders and me will work in the Headquarters from Booking.com in Amsterdam (it is actually the largest ecommerce european website), along with our engineers. 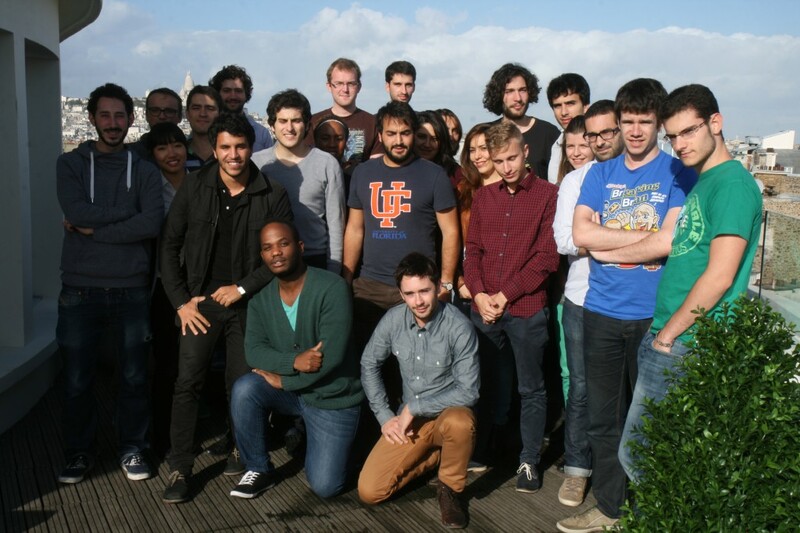 The rest of our Paris-based team will be sad to leave the Partech Shaker but will meet their new colleagues in the Booking.com Paris Office near the Parc Monceau.